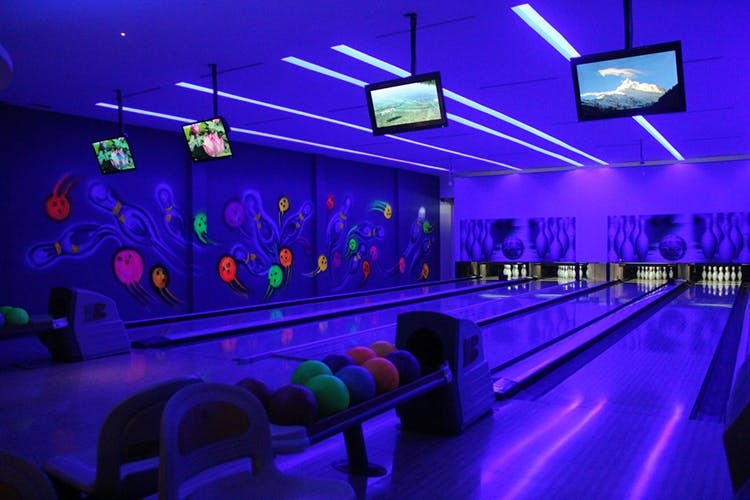 For a fun evening with friends, Blue Moustache offers just that with its eight-lane bowling alley. Go order a beer tower, a couple of sides, and have fun. Blue Moustache is situated next to Fenny’s Lounge and Kitchen in Koramangala. What we love about the place is that it’s got this chilled out vibe that rubs well with the college and work crowd. Be it the open-air seating that’s perfect for unwinding with a bottle of chilled beer and enjoying Bangalore’s salubrious climate or the upstair seating for live music and sports screen, you’ll definitely feel relaxed. But truth be told, it’s the bowling alley that wins hands down for us with its eight lanes, blue lighting, and quirky neon graffiti on the walls. You cannot not play a game or two here. However fun drunk bowling sounds, we didn’t do it. Like the good guys that we are, we started off with bowling first and ordered a plate of Peri Peri Chicken and Honey Chilli Potato along with a draught beer tower. Before we had finished the second frame, there was food waiting for us. The spicy chicken strips and the chilli mayo perfectly complemented each other and our drinks. While we loved the spicy chicken, it’s the crispy and sticky potato wedges that won it for us. And since we were already stuffed, we settled for a Penne Arabiatta. While it’s not really the place to have pasta, but these guys do a good job with their tomato-chilli basil sauce that’s rich and flavourful. Apparently, they also have live music and karaoke nights, so we are definitely going for that. Apart from that, we’ll see you at the bowling alley.